Son of long-time Senator Birch Bayh. 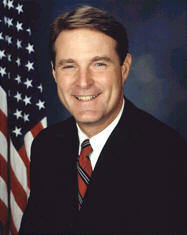 As Governor of Indiana in 1989-97, Bayh was the youngest governor in the nation. Elected to US Senate in 1998, defeating Paul Helmke to succeed Senator Daniel R. Coats. Served two terms as a moderate Democrat in the Senate, and did not stand for re-election in 2010. Succeeded by Coats.